"Take heart. There's hot tea waiting to warm us and gloves and hats and layers—but more so because someone is out there riding a bike to and fro no matter what." At the time of this writing, it is January (2008), that hard month after the holidays have been boxed up and the New Year properly ushered in and what we see ahead of us is only another frigid block of time called February. It's cold across the entire nation. Weather maps in the newspaper and on the internet show blue and white splotches spiraling round and round, reminding us that breath is sometimes something we can see and that our skin is a very feeble defense, indeed. But take heart. There's hot tea waiting to warm us, gloves and hats and layers we can don—but more so because someone is out there riding a bike to and fro no matter what. Bundled tightly, snot frozen in clear strings across cheeks and lips, pure conviction. It's close to zero outside, but they know their bodies, when pushed to respond and transport themselves, will warm up unbelievably and move despite everything. 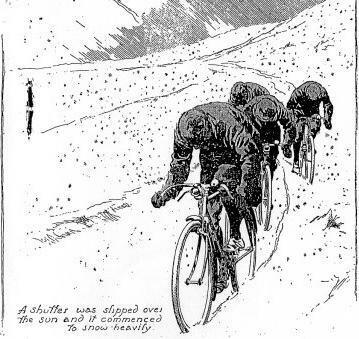 Everyone will be soon be complaining about how hot it is, but they will ride then, too, because they have chosen to rely on their legs and a frame and some intricate components and ball bearings and rubber and leather and gumption. It is these hardy among us that Boneshaker has in mind. You are not daunted easily. You pedal on without recognition—and if you do get recognized, it's usually via horn or outstretched figure. Imagine if we could harness or otherwise bottle your retenue! You (with your cold toes and wind-burned face) just ride. Ride on. Be well and safe—the future needs you.